Explanation: Big, beautiful spiral galaxy NGC 7331 is often touted as an analogue to our own Milky Way. About 50 million light-years distant in the northern constellation Pegasus, NGC 7331 was recognized early on as a spiral nebula and is actually one of the brighter galaxies not included in Charles Messier's famous 18th century catalogue. Since the galaxy's disk is inclined to our line-of-sight, long telescopic exposures often result in an image that evokes a strong sense of depth. The effect is further enhanced in this sharp image from a small telescope by galaxies that lie beyond the gorgeous island universe. 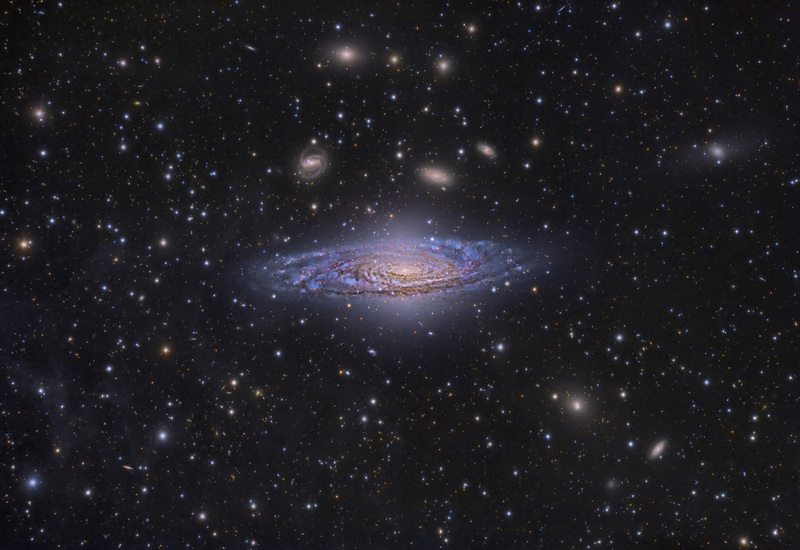 The most prominent background galaxies are about one tenth the apparent size of NGC 7331 and so lie roughly ten times farther away. Their close alignment on the sky with NGC 7331 occurs just by chance. Seen through faint foreground dust clouds lingering above the plane of Milky Way, this visual grouping of galaxies is known as the Deer Lick Group.